Oak wilt, one of the most destructive tree diseases in the United States, is killing oak trees in central Texas at epidemic proportions. Oak wilt is an infectious disease caused by the fungus (Ceratocystis fagacearum), which invades and disables the water-conducting system in susceptible trees. All oaks (Quercus spp.) are susceptible to oak wilt to some degree, but some species are affected more than others. Red oaks, particularly Spanish oak (Q. buckleyi), Shumard oak (Q. shumardii), and blackjack oak (Q. marilandica), are extremely susceptible and may play a unique role in the establishment of new oak wilt infections. 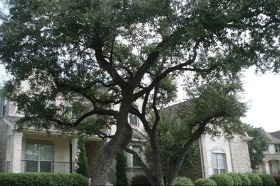 White oaks, including post oak (Q. stellata), bur oak (Q. macrocarpa), and chinkapin oak (Q. muehlenbergii), are resistant to the fungus and rarely die from oak wilt. Live oaks (Q. virginiana and Q. fusiformis) are intermediate in susceptibility to oak wilt, but are most seriously affected due to their tendency to grow from root sprouts and form vast interconnected root systems that allow movement (or spread) of the fungus between adjacent trees. The successful management of oak wilt depends on correct diagnosis and an understanding of how the pathogen spreads between different oak species. Early detection and prompt action are essential for successful management of oak wilt. Cut and dispose of diseased red oaks immediately. Avoid wounding oak trees, unnecessarily, incorporate proper pruning practices and apply pruning paint on limbs pruned that are more than 2 inches in diameter. Handle oak firewood cautiously, never store unseasoned oak wood from infected trees near healthy oaks. Install a trench at least 4 ft deep and 100 ft beyond the perimeter of infection centers to break up root connections. Cut or uproot all trees within the 100-ft barrier (except those injected with fungicide). Identify susceptible, high-value oak trees in proximity to expanding oak wilt infection centers. Consult a trained and licensed arborist (with certified applicator’s license) for treatment of susceptible trees with injections of Propiconazole (Alamo) or Tebuconazole ( Tebuject). Plant trees resistant or immune to oak wilt. Favor a diversity of tree species in the landscape by planting trees that are adapted to central Texas. Avoid wounding susceptible oaks during planting. 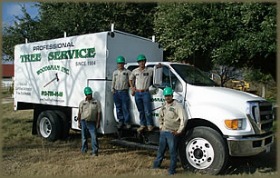 At Woodsman Tree Company, through our certified arborist and licensed chemical applicator, we offer 3 steps of service for Oak Wilt Management. Note: If Oak Wilt is diagnosed in a given Oak Tree, it is the opinion of The Woodsman Tree Company that Tree Death is inevitable. Our only hope is to suppress and contain. Proper management practices are recommended to help keep valued Oak Trees from contacting Oak Wilt. For more information on Oak Wilt in Texas please visit TexasOakWilt.org or the Texas A&M Forest Service page on tree diseases.